Enhancing your outdoor patio areas is simple when you invest in a PGS grill. Imagine 720 square inches of cooking surface, stainless steel cooking grids, and even stainless steel side shelves to store your favorite grilling cooking utensils. Powered by 67,000 BTUs and featuring a one-hour gas flow timer, the PGS T-Commercial Grill is the ultimate outdoor patio accessory. Or perhaps you're in need of a smaller grill. With the PGS Legacy Grill, you can get up to 102,000 BTUs, stainless steel grates, stainless steel burners, and ceramic grill rocks to minimize flare-ups and optimize heat distribution, and much more. You can even choose between two power sources -- natural gas or liquid propane. With so many grills to choose from, you're sure to find one to accommodate all of your preferences and needs. When choosing between the different types, though, you'll definitely want to consider the various mounting options. Some grills can be mounted on permanent posts. Others have pedestal mounts and some can even be built directly into a permanent setting, like an outdoor kitchen area on your back patio. The best type of mount option to choose will depend on a variety of factors. Do you want the mount to be permanent? Do you want it to be portable? How much space around the grill is there going to be? What type of fuel do you want to use? All of these factors will have a direct impact on the patio grill you should buy. Let's take a closer look at the various grill mounting options and tips for choosing the most appropriate one. The PGS A & T series natural gas grills are available with a permanent post mount. They are ideal for permanent placement and since there is no base, they free up floor space. This is especially advantageous if you have a small patio. 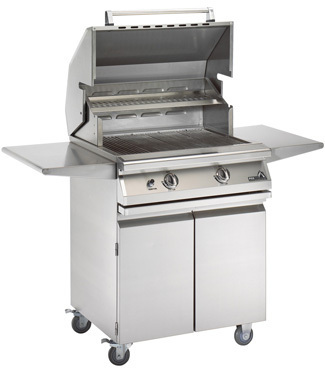 The A & T series grills can also mounted to a grill pedestal. This option tends to be more aesthetically pleasing. It also has advanced stability since the grills are secured by a base straight to the floor. If you would like a more portable option, you can even have the grill installed on a base with wheels. The A-series grills can be portable when installed on a pedestal mount with the wheels. Legacy grills, however, are installed mounted on a cart with wheels. Your preference will determine which grill can best suit your needs. Portable grills tend to be very convenient because you can move them as needed. Plus, they are easier to move and clean behind. They can be completely moved away from the wall, allowing you to clean the entire area around and behind the grill. If you're wanting to raise the value of your property, you should consider a built-in grill mount. Available in both natural gas and propane, built-in grills are very aesthetically pleasing and provide a permanent grilling option. The A, T, and Legacy grills are all available with the built-in option and each series boast a wide range of benefits, including optional side shelves, gas shut off timers, and more. While the mounting option of a grill will play a large role in the best type of grill to purchase, you should also take a look at the available features. The T40 is an all-aluminum grill that has its own built-in gas flow timer, allowing you to rest easy if you forget to power down the grill after you're done. In fact, it shuts off the gas after one hour to optimize safety and is ideal in commercial settings. Its highly-efficient burner system cooks food evenly and quickly, making it the perfect green grill. And with a one-year full parts replacement warranty, you can have peace of mind in knowing you're spending your money wisely. PGS grills can be used both indoors and outside. You'll want to check out our vast selection to see which one works best for you. From pedestal grills to portable grills to built-in options, you truly need to take your time when selecting one. 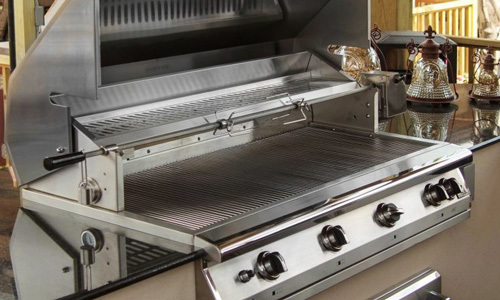 You'll find grills with an infrared rotisserie heater, “moon roks” grill briquettes, gas shut off timers, side shelves, stainless steel burners, and more. In fact, once you start looking at all of the available grills, you'll see for yourself just how important it is to weigh all of your options. You may find you want a natural gas grill. Gas grills with shut off timers are also popular choices. One of the most important things to ask yourself is what do you intend to use the grill for? Are you wanting to use it for recreational purposes, like grilling for the family on the weekends? And if so, how many people are you cooking for? Four? 10? 30+? Your answer to these questions will help you choose a grill that can best meet your needs. If you're wanting to prepare food for more than 10 people, there's a good chance you will benefit the most from a commercial grill that features large cooking space. Contact us today to learn more about choosing a grill that is sure to meet all of your needs and preferences. We have grilling experts to answer all of your questions and to help you through the shopping process.